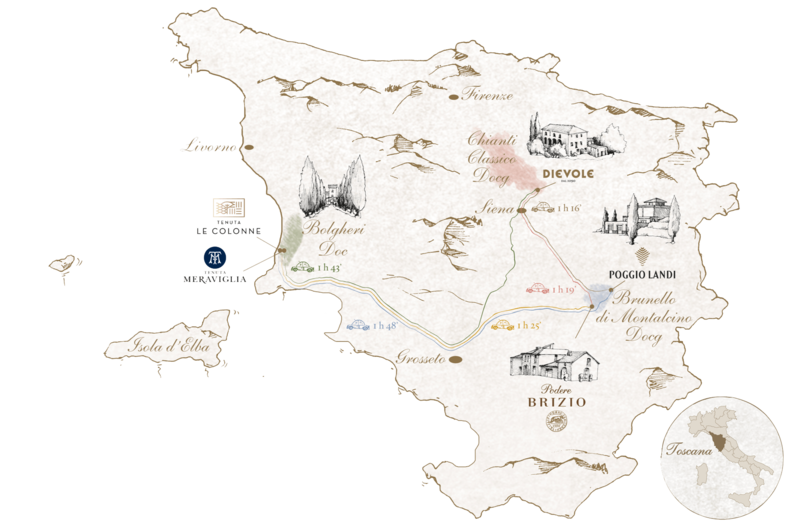 D'Wine Club provides privileged access to the "stars of Tuscan lifestyle", involving all the wineries and luxury hospitality structures belonging to the ABFV Group in Tuscany: Dievole, Podere Brizio, Poggio Landi, Tenuta Le Colonne and Certosa di Pontignano. Becoming a member of the D'Wine Club means immediate access to unique experiences in the most poignant winemaking regions in Tuscany, a way to taste the finest expressions of diverse terroirs: Chianti Classico, Brunello di Montalcino and Bolgheri DOC. For Club Members in Italy, Europe and the U.S., wines can be shipped directly to your home. This service will soon be extended to other countries. Wine lovers can taste fine wines from the Group’s international wineries – Mendoza, Garzòn in Uruguay, Barossa Valley, Bordeaux and Napa Valley – at certain times of the year. alternative tours to the usual tourist offerings, a chance to experience local nature and culture, exploring the beauty of a land that never stops surprising even the most seasoned world traveler. the opportunity to become a Master Member. Even more exclusive benefits for purchasing all our wines. A private tour including an exclusive guided tasting in our historic cellars, with the possibility of inviting up to ten friends. Upon reservation, private use of the prestigious tasting room in our historic cellars, only available to Master Members, their family and friends. At certain times of the year, unique moments dedicated to an Around the World tasting of wines from the international wineries belonging to our Group. Exclusive experience packages to discover Tuscan luxury, a blend of history, nature, haute cuisine, sport, wellness, haute couture and artisan jewelry. Exclusive accommodation packages with breakfast and gourmet menus on our estates. Meet our winemaker and agronomist or vineyard tastings to deepen your knowledge about our wines and to learn more about our production philosophy. Opportunity to emboss your fingerprints in gold dust on a magnum of one of our finest wines. Your date of birth. You must be of legal drinking age. We have already sent you an activation email with all the instructions.